When purchasing your Chicago home, it’s likely you had a list of wants, ranging from something you absolutely must have to things you could regretfully talk yourself into living without. These are the things that make homes worth more in resale, the amenities. The National Association of REALTORS put together a profile of buyers and their preferences when buying a home and the little extras really add up to… cold hard cash. When they conducted their study of what buyers would pay more for, it should come as no surprise that a whopping 69 percent of buyers would pay extra, $1,840 extra, for a kitchen with new appliances. Imagine walking into what looks like your perfect home, and the heart of it, the kitchen, is filled with appliances that look like they survived the Great Depression. Next please! Another 63 percent of buyers are willing to pay $1,590 for an in-home laundry facility. Convenience can be a pretty huge motivator. When you find you’re perfect Chicago home, you don’t want to leave it every weekend to trek to the laundry mat for hours on end, right? Speaking of clothes, after washing all of your garments, you want some place nice for them to rest, don’t you? Well, 60 percent of buyers polled by the National Association of Realtors answered that with a resounding, “Yes!” They would pay an additional $1,350 for a walk-in closet. Still, another 69 percent said they must have a home with central hearing and air conditioning, and they would pay an additional $2,520 to make sure they got it! Having an up-to-date heating and air system can really up your home’s resale value. How do you feel about your in-laws? 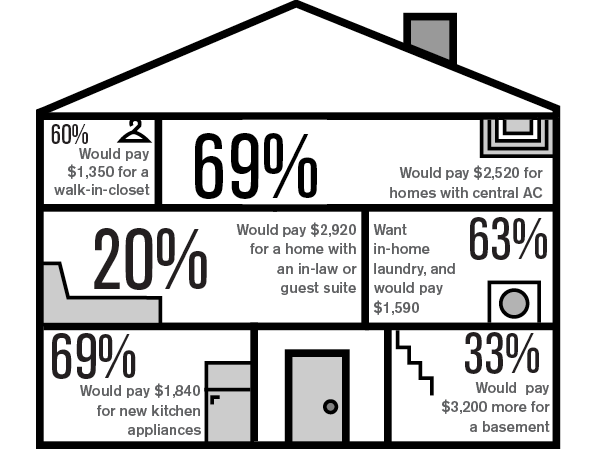 Here’s the most shocking of all the statistics; Twenty percent of homebuyers love their in-laws so much, that they are willing to pay an additional $2,920 to keep it in the family with an in-law suite, and another 33 percent of buyers would prefer a basement for an added $3,200. In this case, more space equals more money. Let’s add this up for the mathematically challenged, shall we? If you upgrade your home to include all of these amenities, you could raise your asking price by at least $13,420! Keep the resale value of your house in mind when completing upgrades and home renovations in Chicago. The chances are, if you like your Chicago home better with some added perks, so will the people who might buy it in the future!